The LED 1000 has come a long way in a short period of time. The newest generation of our flagship model is better than ever. The Plus Series LED 1000 can be battery powered for field work but also includes Cat 5 DMX inputs for work in the studio. Another new feature to our Plus Series lights is a digital display that records a readout of the color temperature and level of intensity from 0-100%. Our 2015 Plus Series lights essentially combines the Pro Series with the Studio Series for an all inclusive unit with the addition of a digital readout. 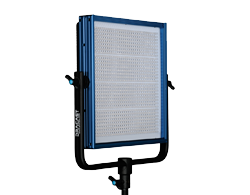 The LED 1000 is available in 3200K (tungsten), 5600K (daylight) or 3200K - 5600K (bicolor adjustable) color temperatures, meaning that there is an LED 1000 for every setting. All of the LED 1000 models are built with solid all-aluminum construction, have almost twice the output of other 1x1 panels at up to 12,500 lux, and are rated at 95 CRI, the highest in the industry. All 1x1 panel lights are not created equal. The 2014 Dracast LED 1000 is the proof.